Should you bring your own wine into a restaurant? —Barbara W., West Allis, Wis. Bringing your own bottle of wine into a restaurant is OK if it meets three criteria: it has to be legal, the restaurant has to have a policy that allows it, and you can’t be a jerk about it. The legality (and enforcement) of allowing customers to bring their own bottles of wine into restaurants varies from state to state, and unfortunately, in Wisconsin it’s against the law. The only people allowed to handle alcohol there are people with liquor licenses—restaurateurs and distributors and the like. If you live in an area where bringing your own wine in is legal, you then have to consider the restaurant’s own policies. If you’re not sure what they are, you can call ahead or check its website. Typically, if it’s allowed, a restaurant will have a “corkage” fee to cover the cost of having its employees open the wine, use its wine glasses, and recoup some of the cost of the fact that you’re not buying something from its own list. If you’re going to bring your own bottle, it’s considered rude to bring something that’s already on the restaurant’s wine list. It should be something more special, rare or old. You should tip to reflect the convenience offered to you on top of the corkage charge you’re paying. It’s always nice to offer a taste to whoever is serving you, or to leave a little bit in the bottle for them to learn about the wine you brought. 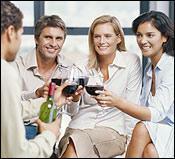 For more on this topic, read Is It Time to Open Up Corkage Laws? and Corkage Etiquette: What to Know When You BYO.